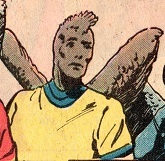 Powers/Abilities: Like other Aerians, Khup is a a humanoid possessed of various avian characteristics, like large-feathered wings (with a wingspan of perhaps 15') with which he could fly, at speeds of perhaps 30-60 miles per hour. The Aerians may have had feathers instead of hair or they may have had hair in addition to feathers. He likely had adaptations to assist in flight, such as porous, bird-like bone, and/or eyes adapted to resist high-speed winds, etc. (Ka-Zar the Savage I#3 (fb) - BTS) - First lieutenant to the Aerian leader M'Dom Typ, Khup was part of, if not the leader of, a plot to assassinate Khup and to overthrow the kingdom, possibly to usurp the rule or to institute Anarchy. 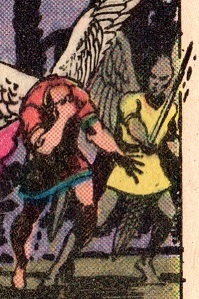 During an upcoming Kelta tournament (which involved two teams of Aerians fighting with wooden swords and shields), the team opposing Typ's team would have their swords dipped in a mild drug that would subdue Typ's teammates, while Khup's sword would be dipped in snake venom so that he could slay Typ. Most, if not all, others participating in the plot were not told who led the plot nor whose sword would have dipped in the lethal venom. (Ka-Zar the Savage I#3 (fb) - BTS) - Khup captured a skite (the flighted steeds used by non-Aerians to participate in Aerian games) from the island of Nahgren and brought it to Aerie Shalahn. (Ka-Zar the Savage I#3 (fb) - BTS) - During the Kelta tournament, Khup was informed by one of Typ's physicians that he had detected a drug in the blood in a fallen warrior from Typ's blue team. (Ka-Zar the Savage I#3 (fb) - BTS) - As the tournament stretched into the evening, Typ noted how his blue warriors were suffering heavy casualties rather suddenly, with the men falling and not getting back up after receiving only a scratch. 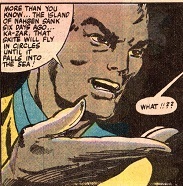 (Ka-Zar the Savage I#3) - Just after Typ mentioned this to Ka-Zar, Khup used a torch to attract Typ's attention. Typ swiftly flew down to Khup, who informed him of the reported poisoning. Typ was outraged as he had strictly forbidden anything of the sort, but Khup confirmed the information and noted that things were even worse. He asked Typ to come with him to hear what one of the captured red team had to say. At the field hospital, Khup stood by as Chan informed Typ that his own red teammates had grievously wounded him; Chan continued that there were plans to overthrow the kingdom and that the games were fixed; Chan felt that he had been stabbed as a result of anarchy. While he didn't know who was responsible, Chan related that their wooden swords had been dipped in a mild drug and that the fallen blue team members would survive; however, one sword had been dipped in snake venom, and that it was to be used to assassinate Typ. Before passing out, Chan related that the holder of the snake venom-coated sword had been kept secret. Typ then ordered Khup to summon Ka-Zar and Shanna, as well as those who had been with Typ the longest; Typ was going to meet with his wife, Wend, and then meet back up with Khup later. As Khup located Ka-Zar, he overheard Delphine (who was infatuated with Ka-Zar and jealous of his lover, Shanna) telling Ka-Zar how she had put Shanna on a hoxing (in heat) skite. Khup interrupted the conversation, calling Delphine a fool and explaining how a hoxing skite would brave anything to return to its birthplace...which was made all the worse by Nahgren having sunk six days ago; the skite would carry Shanna in circles over the sunken island until it fell into the sea. Typ and Wend arrived soon after and informed Ka-Zar of the assassination plot, but Buth (Delphine's lover) then challenged Ka-Zar; while Buth was simply jealous over Delphine's attempts to seduce Ka-Zar, Ka-Zar and Typ assumed Buth to be the assassin. Khup stood by Typ's side as they watched Ka-Zar battle Buth. However, as Ka-Zar subdued and prepared to kill Buth, Khup stabbed Typ, mortally wounding him. Alerted by Typ's agonized screams and (presumably, as it was off-panel) Wend's lamentations, Ka-Zar released Buth and used his sling to nail Khup in the head, dropping him. Comments: Created by Bruce Jones, Brent Anderson, and Carlos Garzon. As far as I recall (although I'm working through the series), Khup was never seen again, and his fate was not clearly revealed. However, as Ka-Zar used his sling against Khup, the narrative text described Ka-Zar as "drawing his lethal sling," which would strongly imply he killed Khup with the hurled stone. Khup's motivations are not clearly defined. He went out of his way to make sure Typ was aware of the assassination plot by distracting him from combat and bringing him to Chan. 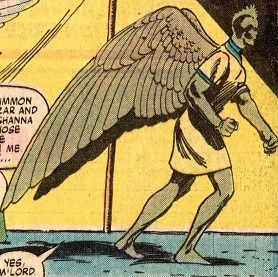 By informing Ka-Zar of the hoxing skite, he may have been trying to get Ka-Zar to leave and go after Shanna, or he may have just been trying to distract Ka-Zar.